The gilt-head sea bream is known by various names. It is known as royale bream, by its Latin name, which is Sparus aurata, and by its French name, which is dorade royale. The gilt-head sea bream is considered as the best tasting fish of the breams. You can find gilt-head sea bream in the Mediterranean Sea, which is known as FAO fishing area 37. The gilt-head sea bream is available throughout the year since it can be farmed as well as caught. Our sea bream is primarily farmed in the countries Greece and Turkey. We also have caught sea bream available, but as a supplier we prefer to farm it because catching sea bream is really difficult because of its scarcity. The low availability of sea bream is also the main reason why sea bream can be quite expensive. We sell our dorade royale whole round, scaled, gutted, head on, headless and butterfly cut. We also have dorade royale fillets available at our ‘Fish Worldwide’-page. The sea bream is characterised by the golden mark between its eyes. It lives in marine waters as well as in the brackish waters of coastal lagoons. The taste of the fish is often compared to the taste of sea bass. Like every fish, the sea bream contains a lot of protein. One hundred grams of gilt-head sea bream contains on average twenty-one grams of protein. 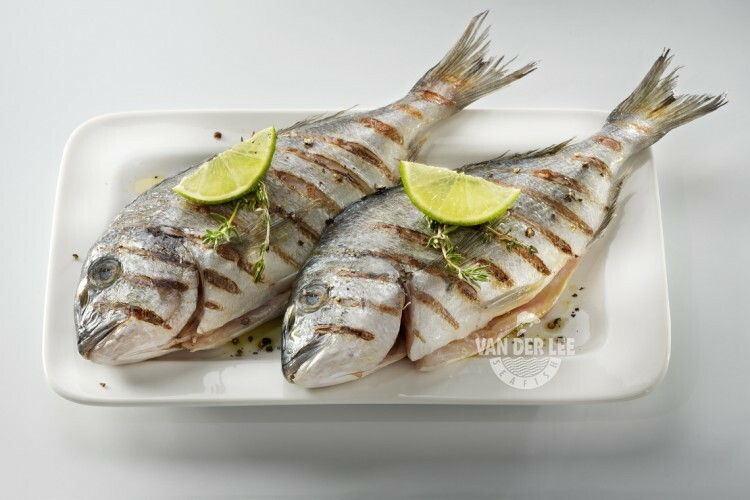 Sea bream also contains vitamin D, which is necessary for your immune system, neuromuscular system and to promote bone growth. Thereby, sea bream is also good for you because it is low in sugars and it does not contain any saturated fat. It also does not contain much calories, since one hundred grams of sea bream only contains around 139 calories on average. We sell our dorade royale particularly to restaurants. Our export goes mainly to the countries Italy, Germany, Spain and the Netherlands. Sea bream is especially popular in Mediterranean countries like Italy and Spain. But nevertheless, the fish is also quite popular in Germany. In Germany the fish is called ‘Goldbrasse’ or ‘Dorade’. In Italy they call it ‘orate’, which refers to the gold bar marking. In Spain the fish is called ‘dorada’. Gilt-head sea bream is mainly used as a main dish. It can also be used for the barbecue and it can be grilled. You can also fill your sea bream with spices or you can serve it with lemon juice or lime juice. This will make the fish even more delicious than it already is!